This message of gratitude is way, way, way overdue! A couple years ago a fellow ALT introduced me to your work. I work at a Technical High School in southern Japan and your lesson materials have been a godsend! The students love your worksheet designs/characters, so that has helped to keep classes running smoothly as they are engaged with the work. Over the last couple years, I have used the Introduction worksheets for my self-introduction and follow up class of getting to know the students. The speed interview has gone so well that I have now incorporated it into the students yearly curriculum by using it as a speaking test. The 1st-years complete the questions you provided 3-4 times in a year, and from this year I have created new questions (level up) for the 2nd and 3rd-year students. I even run inter-class competitions by providing a prize to every student in the class which can raise their class average the most. It has been a lot of fun and is such a great way to encourage speaking! 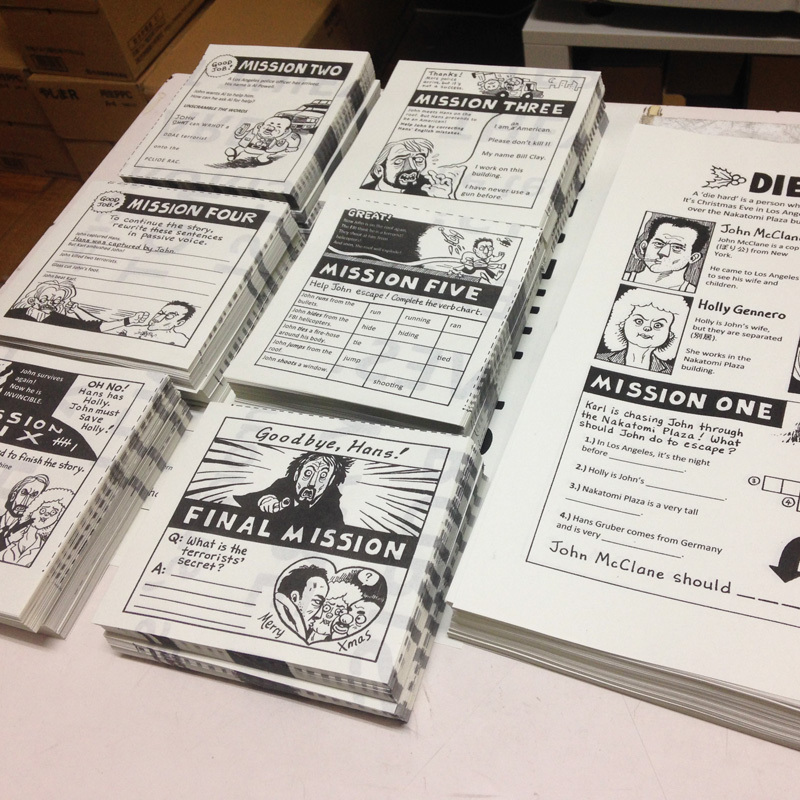 Last year I also used your Die Hard activity as the final lessons for the graduating 3rd-year classes. It was a bit of a challenge for some of them but they had a lot of fun, and it was a good reminder for them to keep practicing the foundation grammar they had learnt over the years. Thank you for making my job a tonne of fun and much easier than it could be! Thank you so much for the feedback! It sounds like you use my materials even more effectively than I did, which is great! In the classroom, I was an OK teacher, but not the best, which is why I love to hear how other teachers use my worksheets etc. and the response they get from their students. I’m not creating new materials anymore, but I do still have a small pile of existing materials that need to be formatted and added to the gumroad shop. It’s been on my ‘to do’ list for a long, long time, I’m afraid, but messages like yours are a good motivator! Hey there! I am actually the ALT that replaced Rhiannon after she left the program. I also wanted to express my gratitude towards you and your amazing activities! The Die Hard activity in particular was suuuuch a hit with the 3rd graders. Your activities have really made my first 6 months teaching a blast, and your dedication to these worksheets has given me inspiration for all of my future lessons. Thanks! Wow, that’s great to hear! Thanks for checking in!